Batrix is changing the landscape of banking as you know it! Our platform is built of Blockchain technology to ensure our clients’ privacy and security. Is it time you joined the Batrix lifestyle blockchain banking revolution? Batrix is the future of banking. We combine lifestyle services with traditional banking methods and the cryptocurrency world to combine all their benefits in one blockchain lifestyle banking platform. Using leading blockchain technology, Batrix offers the ultimate protection in online banking, which is an essential element during the time of high risks in cybersecurity, making sure your investments are protected. By making use of blockchain banking technology, Batrix provides all customers with the highest levels of protection. This is essential considering today’s risks circling the cryptocurrency world. Instead, make sure your investments are protected with Batrix. Batrix offers account services, combined with a variety of lifestyle services and membership rewards. Watch our video and see how Batrix works! The Batrix platform is programmed from the ground up. Using leading blockchain banking technology we have made our infrastructure scalable, fast, secure, and adaptable. This enables our systems to keep up with the fast-paced financial and lifestyle industry and its needs. The blockchain’s decentralized banking allows its network to take over from governments and other verification control. All validation is completed on the blockchain banking network. Our secure mobile app has a built-in cryptocurrency wallet, allowing users to manage both fiat and crypto from one accessible place. Batrix will partner with a cryptocurrency exchange trading platform for major digital assets & cryptocurrencies. The integrity of the data passing through the network is verified, controlled, recorded and shared. Thus, ensuring no fraudulent activity occurs. Batrix takes the security and privacy of its users very seriously; we offer a secure mobile blockchain wallet as part of our service. Our built-in artificial intelligence function, aids users to build their crypto wealth more efficiently by providing trading tips and advice. Spending insights are a great way for you to gain a clearer picture of your spending trends and to identify the areas where you spend the most. Expenses are instantly viewable on your statement and you will receive notifications of any incomings and outgoings in real time. Our mobile application is compatible with Apple Pay and Android Pay on a plethora of devices and wearable technologies. For additional security, you can store your funds in a vault with time delayed withdrawals. Subject to status, if you have a mobile phone, you will be offered a fully-fledged current account. Our current accounts will offer free domestic transactions, as well as multi-currency international transfers at competitive rates. One of our most unique components is our global reach of offered lifestyle service, through our many partnerships. Our current accounts will cater for direct debit services and standing order requests, as standard. Our banking facilities will include credit cards with balance transfers, money transfers, and purchases all at very reasonable rates. Our members and customers will be able to take advantage of a complementary digital currency wallet in order to manage their crypto wealth easily. Our current account holders will have access to a traditional debit card which is accepted globally and can be managed from our app. Batrix operates 24/7 customer service globally, giving you help & support at your fingertips, around the clock! Our exclusive members will gain exclusive access to an array of services designed to give them the ultimate banking experience. The following table shows how Batrix compares to other crypto platforms and traditional banks. 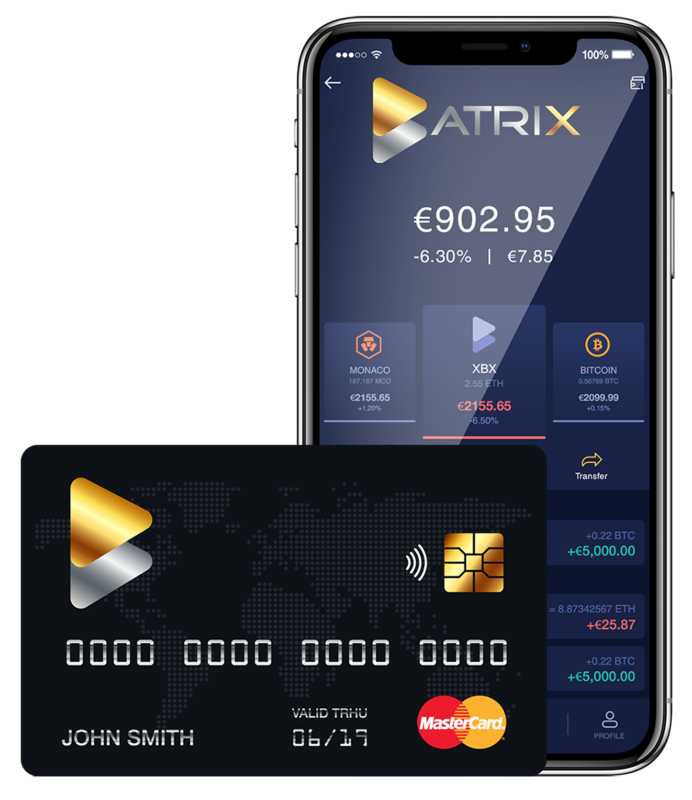 Batrix aims to become a fully-fledged mobile-only bank, for anyone with a mobile phone, looking to manage and grow their assets from one app whilst having access to a range of luxury banking services as well as exclusive benefits. What problem is Batrix going to solve? Batrix platform will provide liquidity of crypto assets, which will help overcome the major issue in the industry. Batrix aims to serve the driven growing upper middle class, by creating a community of these driven, entrepreneurial individuals who strive to reach their best lifestyle and beyond what a decentralized economy has mandated. Batrix will support this community by providing them with exclusive services from finance to mind and body. How can XBX be used? The XBX token can be used as a payment method to receive discounts on banking and card issuing fees, as well as on services and products from our exclusive partnerships. Making XBX the first token to be used to make payments to merchants using our API. Tokens will be transferable one week after the ICO is closed. What is the amount of your soft & hard cap? The soft cap is €4,000,000 and the hard cap is €40,000,000. Is there a nationality restrictions from participating in your ICO? Unfortunately, due to legal and regulatory uncertainty in the USA, US citizens and residents are prohibited from making contributions and participating in the Batrix (XBX) token sale. Moreover, the sanction jurisdictions Iran, North Korea, Syria, Cuba. What is the value of 1 XBX? Can I see the ICO smart contracts? Please refer to our Github account. What contribution method & currencies will be accepted? We accept both Cryptocurrency and Fiat as methods of investments. Please see below for the currencies that we accept. For Fiat money, we can only accept payment by bank transfer. Those interested in investing via Euro will receive our bank account details individually. Via our live chat facility. You can also always contact us via phone and one of our friendly advisors will be able to answers your queries. Are registration & KYC mandatory? Yes, registration and KYC are mandatory to be eligible to participate in our ICO. I was too late for the token sale, but I’m still willing to become an XBX token holder. What can I do? If you were too late to buy XBX tokens during the token sale, you’ll be able to do this on the open market which will appear in the near future without Batrix’s direct involvement.